It’s that time of the year again when families and friends get together to spend quality time and create new memories. Winter is especially difficult for seniors making them more vulnerable to the risks posed by plunging temperatures, snow, slippery roads and sometimes even loneliness. We understand this and have put together tips and preventative measures for you and your aging loved ones to keep everyone safe, healthy and merry this season. As beautiful as they are, Canadian winters can sometimes feel long and harsh. Those who have experienced winter in Canada have a good idea of what to expect and how to prepare. Preparation is key and these tips below will get you winter ready. Bundle up : Your senior loved ones should always dress in layers – two or three thin layers will keep them much warmer than one thick layer of clothing. They should never leave the house without a heavy jacket or coat, warm socks and boots, scarves, gloves (or mittens) and hats. Wearing clothes in layers is also advisable indoors. Help them prepare their closets for winter by packing away summer clothes and organizing their winter wardrobe so it is easily accessible. Check the weather and road conditions before going out. Prepare an emergency kit for their car. Experiencing an emergency on the road is always a hassle. In the winter, it could be fatal. With temperatures consistently below -10°C, preparation and planning are essential. Have their car checked and tuned up for winter. Consider winter tires. In some areas of Canada, winter tires are mandatory. For example, all passenger vehicles registered in Québec, as well as taxis, must be equipped with winter tires. Seal windows and doors with weatherstripping and caulk cracks to keep the cold air from coming indoors. Have the chimney checked and cleaned or sealed off if it is not being used. It is best if seniors use a fireplace with supervision. Call a professional to service the furnace and be sure to change filters regularly. Set ceiling fans clockwise to circulate warmer air and push it down. Prepare a designated spot for winter shoes inside the front door to prevent tracking in snow and creating dangerous, slippery areas. Even if the home doesn’t have a foyer, create a winter “station” with a bench, mats, hooks for hanging outerwear, and baskets for gloves, scarves, and hats. Keep an extra set of blankets around the house for extra warmth when needed. Driveways, sidewalks, and walkways should be shoveled and cleared for safety. Playing board and card games have always been a family favourite. Games promote bonding and other benefits including stress relief, improved brain function, and boosted creativity. Stay warm by indulging in hot cocoa and tea. Snuggle up in cozy throws and watch a holiday film together. Gather together for holiday decorating, whether it’s cookies or the tree, decorating is a lovely time to include your loved ones and help them feel included. Enjoy an outing to your local library. Some libraries host special winter activities such as games and movies. If an elderly loved one is traveling, here are some tips to keep in mind. With proper preparations and planning in place, you and your loved ones can make the best of the season. Winter is a time to slow down and reflect, to go inward and renew. If you need extra help during this busy time of the year, reach out to family and friends, or take advantage of services that lighten your load at home. 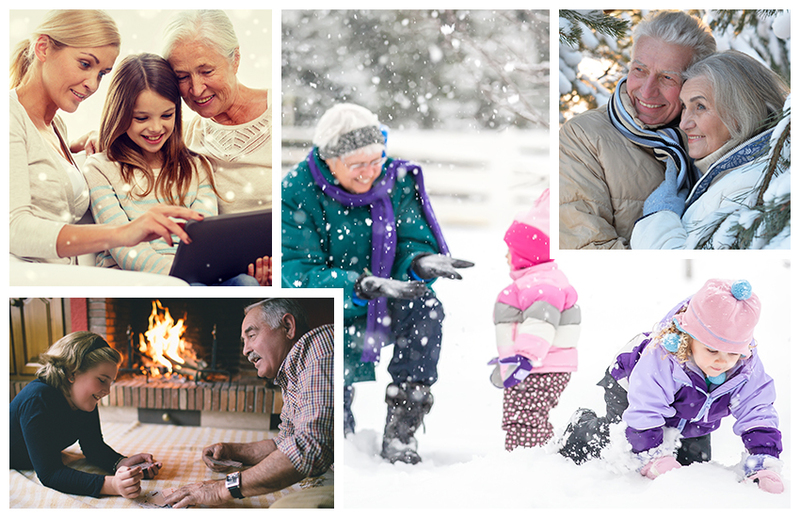 Spend quality time with your family this holiday season and let the trusted Bayshore caregivers provide personalized care. Professional caregivers can provide you with much-needed respite care. Caregiver burnout is real and sometimes it can be difficult to identify as such. To learn more about home health care services, call us at 1-877-289-3997. We at Bayshore Healthcare wish you all the joys of the season!